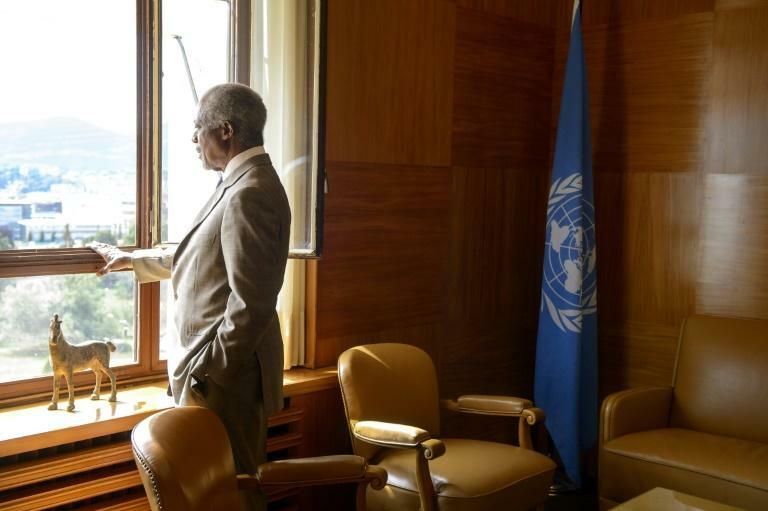 As tributes flooded in from around the world Sunday for former UN chief Kofi Annan, Switzerland mourned a "visionary" who helped bolster his adopted home's position as an international diplomatic hub. The Ghanaian national and Nobel peace laureate, who died Saturday at the age of 80, has been widely credited with raising the profile of the United Nations during his two terms as secretary-general from 1997 to 2006. In Switzerland, where he settled after completing his second term, Annan is meanwhile widely remembered for his many deep friendships and for his contributions to securing the status of the country and especially of Geneva as a centre for world diplomacy. "Kofi Annan was a visionary and a great friend of Switzerland," Swiss President Alain Berset tweeted out shortly after the announcement Saturday. "Today, International Geneva has lost one of its most ardent advocates," he added. The head of the UN's European headquarters in Geneva, Michael Moller, meanwhile lamented that "humanity has lost its strong moral voice, and I lost my mentor, my role model and great friend." Annan's long-running relationship with Switzerland began in the early 1960s, when he obtained a degree at the Graduate Institute of International and Development Studies in Geneva. Early in his four decade-long UN career, he also lived intermittently in the city, when he worked for the World Health Organization in the 1960s and later for the UN refugee agency in 1980. And it was in Geneva that he met his second wife, Nane Lagergren, a Swedish lawyer at the UN. They were married in 1984. As UN chief, Annan was instrumental in convincing Swiss voters to allow their country to finally join the world body in 2002, according to Joseph Deiss, a former Swiss president and former head of the UN General Assembly. "He played a discrete but very important role in reassuring our citizens," Deiss, a personal friend of Annan's, told the ATS news agency. "I think he had a weakness for Switzerland... He was a great friend of our country," he added. Former Swiss government minister Adolf Ogi, who was appointed by Annan as UN Special Adviser on Sport for Development and Peace in the early 2000s, meanwhile described him as a "tender, exceptional man". He told the Matin Dimanche weekly that Annan, who became a good personal friend, had come to see him and hike with him for several days in the Swiss Alps in 2000 before announcing his UN appointment. "I only understood later that he was testing me, man to man, to see if we could work together in the UN," said. It was perhaps after he completed his decade at the helm of the UN that Annan did the most to boost Geneva's international status. After settling in the city, he established the Kofi Annan Foundation there in 2007 devoted to conflict resolution. In 2010, his family moved to the small village of Founex in the neighbouring canton of Vaud, but he continued to accept high-level diplomatic missions from the UN and supported numerous programmes and initiatives by international organisations based in Geneva. "He was a generous and discrete person, who wanted to prolong what he had been doing at the UN," said former Swiss president Ruth Dreifuss, who received Annan's support for her global commission aimed at decriminalising drug use. Cartoonist Patrick Chappatte meanwhile told Le Matin Dimanche that Annan had offered important support for his Geneva-based Cartooning For Peace foundation. "Despite the differences in age and social milieu ... Kofi Annan honoured me with his friendship," he said, describing him as "extremely friendly, completely authentic". "Big men are measured by their small gestures."